Pictured from left to right: DEP Secretary Noah Valenstein and JU MSRI Executive Director Dr. Quinton White. 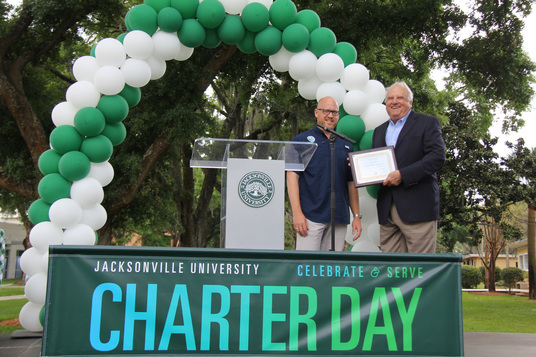 JACKSONVILLE, Fla. – Today, the Department of Environmental Protection's Northeast District recognized Jacksonville University for its exemplary commitment to environmental awareness and protection. Sustainability and conservation initiatives implemented by the University include energy-efficient upgrades, recycling efforts, water conservation programs and environmental activism in the community. The Northeast District, headquartered in Jacksonville, provides environmental permitting assistance, emergency response and environmental education outreach in 19 counties from the Atlantic coastal plain to the Gulf of Mexico. The natural and ecological value of Northeast Florida is reflected in its vast water resources -- the district has more rivers than any other including the St. Johns, Nassau, Tolomato and historic Suwannee and Santa Fe rivers. The district is committed to DEP’s vision of creating strong community partnerships, safeguarding our state's natural resources, and enhancing its ecosystems. For more information, visit https://floridadep.gov/northeast.